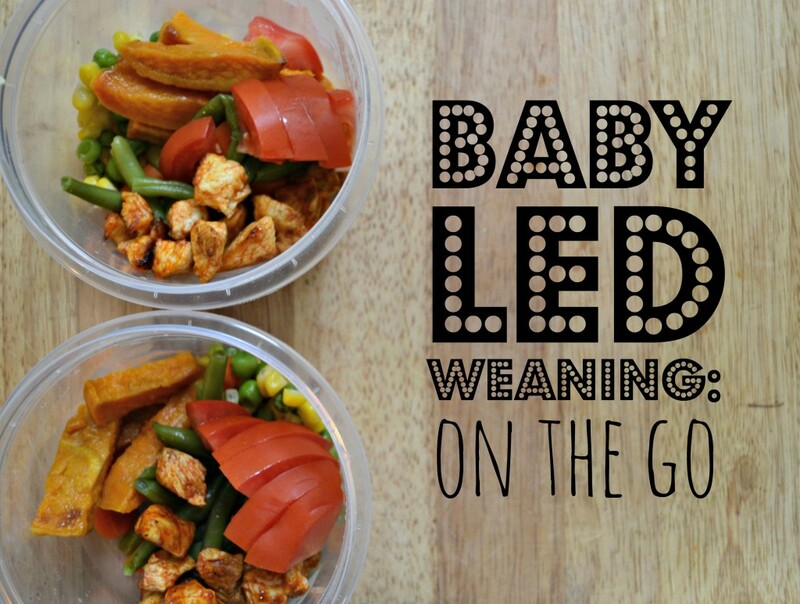 In my opinion, one of the best parts about baby led weaning is the freedom of it. I can go anywhere and not have to worry about a spoon or a jar or pouch of food. I can eat my meal without hovering over Ryan, or having to feed him myself. I always eat a hot meal because I eat with Ryan. I’m never (okay, rarely) rushed and we get to eat every meal as a family. We have been taking Ryan out to eat with us since he was about 3 weeks old. Our first trip was Chipotle (cue surprise) and about a week or two later we went to our favorite sit-down Greek restaurant and he slept the whole way through. When he was about 7 months old and getting really into eating, we started bringing him his own little meals when we went out to eat. Like I said, he eats when we eat. People are always amazed watching him eat like a little grown up as well as his surprisingly good table manners. Along the way we’ve picked up a few tips, tricks, and gear for making baby led weaning on the go easier for both you and your little eater. A Mat. We bought this silicone place mat by Summer Infant and fell in love almost immediately. It has 4 suction cups to stick to the table, a spot that catches all the dropped food, it’s easily wiped down and cleaned, and folds up into a little tube shape to throw in your diaper bag. Sometimes the suction cups don’t work perfectly, depending on the material of the table, but it’s never been a huge issue for us. Also, if you wet the cups a little, they stick much better! Wipes. This is a given, but it’s a huge part of making this work. I use antibacterial wipes on the table and then normal baby wipes to clean off hands and face and we’ve never had a problem. Find what works for you and make sure you always have at least 1 full pack in your bag. Trust me, being out and running out of wipes during a meal is no fun. Not that I speak from experience. Containers. 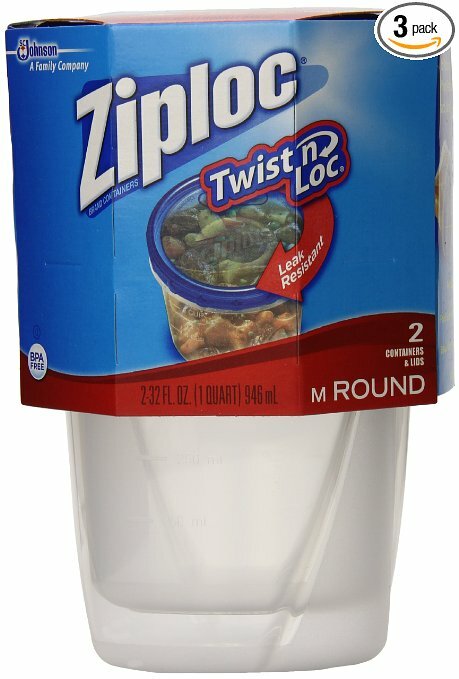 I like Ziploc Twist n’ Lock containers the best. They have a screw top so they have never leaked in my bag, and they’re the perfect size for a meal. I use these for everything and end up buying about a pack a month. Inevitably, one gets left somewhere, I throw one out, or I give one away. Sippy cup. 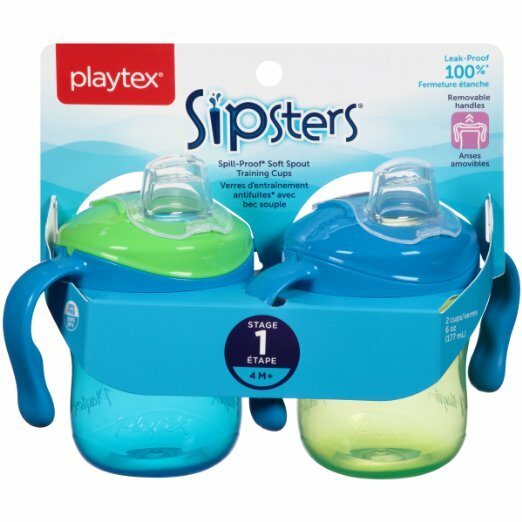 This is the sippy cup we use, but bring whatever your child is using at the moment. We like this one for younger babies, and this CamelBak one for older kids. The CamelBak one is AMAZING and basically indestructible. I suggest one with a lid if you plan on bringing water or whatever with you, but I’ve brought an empty with me and filled it up at the restaurant many times. Essentially, it’s whatever we would put on Ryan’s tray at home, in a container! Then I dole out a little at a time as needed. I usually put a little extra of everything in case he’s feeling one thing over the other that day or in case, a lot of it hits the floor. 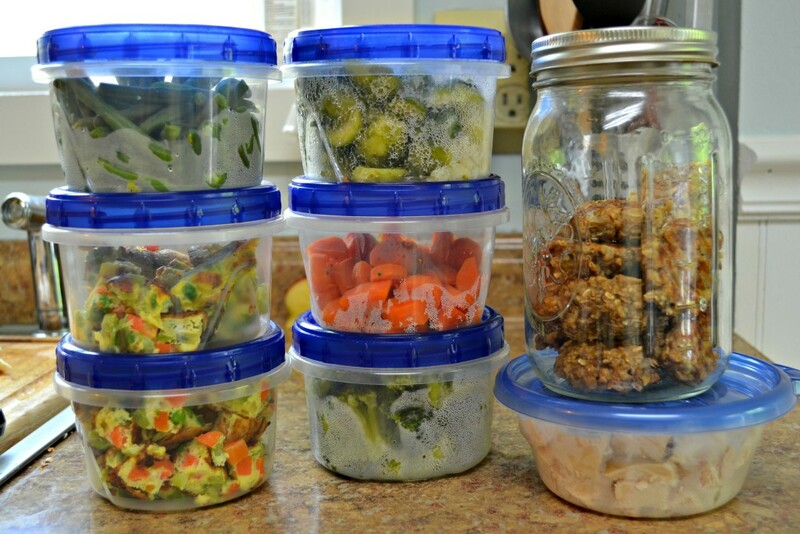 –Prepping food once or twice a week makes making quick meals (both for going out and staying in!) easy and stress-free. Meal planning and prep isn’t just for your meals!! -Frozen corn and peas make great ‘ice packs’. If it’s going to be warm or I know that we’ll be out for a while I put a generous handful of corn or peas on the top and bottom of the containers and by the time we eat most are defrosted so they’re edible and it’s kept the rest of the food safe to eat. -I know it’s a bummer, but clean up the best you can before you leave. Especially if it’s somewhere you plan on going again. It’s common courtesy! -As you get more comfortable, sharing your meal is fun as well! We didn’t start this with Ryan until he was 12 months, partly because of his allergy, but also because of recommended sodium. Use your gut, do what feels right for you and your family. -Put in a few “sure things” that will keep your little one entertained, happy, and willing to sit for an extended amount of time. For us, it’s larger chunks or slices of (now, raw) apple, tomato, corn, bread, or fruit in general. Also, things that they love but take a while (see raw apple – if I know it will be a longer outing, I’ll give him a half of a raw apple to munch on) to use up time. **Some of these links are Amazon affiliate links. I will earn a little if you make a purchase, but it will not cost you a think. Thanks! The only reason I found this was because I thought I had thought of this great invention – but it existed. It makes me sad that these aren’t more popular/well know, because they are AWESOME. The only way we can really manage eating out a decent amount is to bring Ryan his own food rather than the kid’s menu, and choose places that we know we can do affordably! I’m loving these posts- keep sharing! I love writing them! It’s such a fun way to introduce my son to food and start him on a healthy foot! That mat is awesome! We have a basic Gerber one that rolls up, but it doesn’t have the little tray to catch the stuff that falls. I’m obsessed with it. The suction cups are my favorite part, since ryan likes to grab and flail it…. I didn’t know this was the official name for this. My cousins do this with their little boy and I think it’s the way to go. Their son is so well behaved at any restaurant because he’s been raised to eat with the adults at meal time. Everyone is always shocked at how well he just sits and eats with us as well! Plus it’s fun! I’m totally going to have to give that mat a try! We struggled with finding something like that for our first, so I won’t delay this time around! It honestly may be the BEST investment I’ve made baby-wise, and it was so cheap! I highly recommend it. It’s also super easy to clean. Lot’s of wise tips in this post! Especially love that you should think of things that take your little one longer to eat. I know if I pack grapes for my toddler they will be gone in 2 seconds and he’ll be looking for more! Also a great tip to take the time to clean up yourself, those babies are messy and I always feel bad for the waitstaff! Great post Morgan! So glad I could be of help! It’s SUCH an awesome way of introducing solids to a baby, I highly recommend it and will be doing it with my second baby as well! Let me know if you have any kind of questions, I’d be happy to answer them!